For its 25 years of ocean stewardship, Senators Barbara Boxer and Dianne Feinstein, and Congresswomen Lynn Woolsey and Nancy Pelosi honored Gulf of the Farallones National Marine Sanctuary with Congressional resolutions this summer. Among notable achievements, program staff supported initial funding for research on endangered humpback and blue whales; initiated the Congressionally-recognized Beach Watch coastal monitoring program, whose data has helped secure multi-million dollar oil spill settlements; collected key evidence identifying the source of “mystery” oil spills from the S/S Jacob Luckenbach wreck, and assisted in removing 100,000 gallons of oil from the sunken vessel. The sanctuary’s 25th anniversary public awareness campaign kicked off with the Third Annual San Francisco Ocean Film Festival. The festival marked the premiere of Cool Water Haven, a documentary on the sanctuary as part of a campaign to raise sanctuary profile in the San Francisco Bay area and nationwide. Working closely with local fishermen, resource managers and scientists, and sanctuary staff are looking at ways to accurately reflect the state of current fisheries, standardize fisheries data, and identify regions critical to fisheries. Having accurate socioeconomic information is important in working with the fishing community and fisheries managers to foster best practices to protect resources and other marine life. Staff are collaborating with local fishermen on a sustainable fisheries initiative that will protect the health of the sanctuary by developing model sustainable fishing communities. The entire report Socioeconomic Profile of Fishing Activities and Communities Associated with the Gulf of the Farallones and Cordell Bank National Marine Sanctuaries was prepared by Ecotrust. Decimated by years of human impacts like oil spills, or disturbing their nesting grounds, once thriving bird colonies along California’s central coast have been on a downward slide. But help is on the way with the launch of a first-of-its-kind effort to protect seabirds by reducing human disturbance at their colonies. Known as the Seabird Colony Protection Program, researchers are developing innovative ways to reach the public whose actions often cause birds to scatter leaving eggs and chicks vulnerable to predation or the elements. To stem that tide, researchers are enlisting the help of ocean users such as boaters, hikers, kayakers, and pilots. Staff are providing maps or leaflets and placing specially marked signs or buoys that inform users on the safe distances from colonies. Additionally, the program continues to look at conservation threats, management needs, and restoration opportunities to get the birds’ numbers healthy again. A key partner in this effort is the U.S. Fish and Wildlife Service. This year, NOAA and the Environmental Protection Agency successfully settled with Dutra Dredging, one of the largest dredging companies in the state, securing $750,000 dollars in fines for dumping or spilling dredged mud into sanctuary waters. The agreement marks the first time the sanctuary and the EPA have worked together to enforce illegal dumping laws. Dredge spoils can affect water quality and affect the entire food web by smothering bottom-dwelling marine life, blocking sunlight, and ultimately change the ecology of the ocean floor. Fines will be applied to habitat restoration. 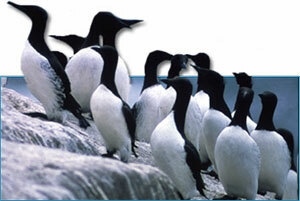 A California seabird, the common murre, is highlighted in a new sanctuary outreach program, Webs Under Waves. Working with partners such as U.S. Fish and Wildlife Service and Point Reyes Bird Observatory Conservation Science, this project will bring the “seabird shuttle” to third through fifth grade classes. Students will learn about the natural history and special vulnerability of the common murre, a penguin-like seabird whose numbers dropped dramatically after a disastrous 1986 oil spill in sanctuary waters. 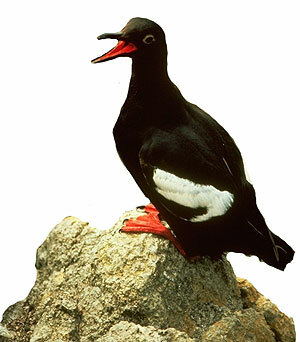 Webs Under Waves includes lessons about the marine food web and seabirds’ place in it, points out special common murre adaptations, and teaches how students can help protect seabirds. The significant absence of krill off Northern California for the second year in a row has caused reproductive failure in seabirds and forced blue whales to forage elsewhere, raising concern amongst scientists. During a NOAA research cruise, SEAS ‘06  Taking The Pulse of the Sanctuary, scientists investigated the relationship between physical oceanographic features and the abundance of marine life in sanctuary waters. The team of scientists conducted around-the-clock surveys for top-level predators such as seabirds and marine mammals, and plankton tows to examine productivity beneath the surface. Preliminary findings confirmed that greatest productivity occurred where ocean features, such as submerged islands and the continental shelf edge, generate upwelling -- the stirring up of nutrient rich waters close to the ocean’s surface. Research findings will be used to help managers understand the complex natural and human-caused factors that affect ocean health. Twenty-five interpretive signs highlighting the richness and diversity of California’s sea life will be installed along scenic coastal areas. Staff will step up efforts to restore the submerged lands of Tomales Bay, and implement a vessel management plan for the area. The plan addresses indiscriminate and illegal placement of moorings in the sanctuary, abandoned vessels, and future sunken vessel removals. Beach Watch Online will capture real-time wildlife observations and data on changes and trends from Beach Watch, a long-term volunteer monitoring project. Data will be integrated into the Sanctuaries Integrated Monitoring Network (SIMoN). Two interactive kiosks at San Francisco’s Aquarium of the Bay will introduce visitors to the National Marine Sanctuary Program, focusing on California’s marine sanctuaries.